Teeth lost to tooth decay can have devastating consequences for a child’s dental health. Not only can it disrupt their current nutrition, speech and social interaction, it can also skew their oral development for years to come. Fortunately, we have a number of preventive tools to curb decay in young children. 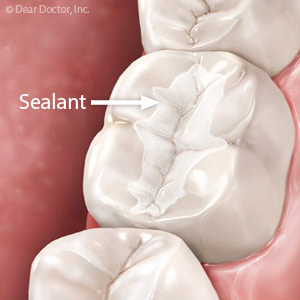 One of the most important of these, dental sealants, has been around for decades. We apply these resin or glass-like material coatings to the pits and crevices of teeth (especially molars) to help prevent the buildup of bacterial plaque in areas where bacteria tend to thrive. Applying sealants is a simple and pain-free process. We first brush the coating in liquid form onto the teeth’s surface areas we wish to protect. We then use a special curing light to harden the sealant and create a durable seal. So how effective are sealants in preventing tooth decay? Two studies in recent years reviewing dental care results from thousands of patients concluded sealants could effectively reduce cavities even four years after their application. Children who didn’t receive sealants had cavities at least three times the rate of those who did. Sealant applications, of course, have some expense attached to them. However, it’s far less than the cost for cavity filling and other treatments for decay, not to mention future treatment costs resulting from previous decay. What’s more important, though, is the beneficial impact sealants can have a child’s dental health now and on into adulthood. That’s why sealants are recommended by both the American Dental Association and the American Academy of Pediatric Dentistry. And while sealants are effective, they’re only one part of a comprehensive strategy to promote your child’s optimum dental health. Daily brushing and flossing, a “tooth-friendly” diet and regular dental cleanings and checkups are also necessary in helping to keep your child’s teeth healthy and free of tooth decay. If you would like more information on preventing tooth decay in children, please contact us or schedule an appointment for a consultation. As the youngest person ever to host Entertainment Tonight, Maria Menounos, an independent filmmaker, actress, and co-host of daily entertainment news program Extra, has made a huge splash in the world of entertainment journalism. However, she is also an avid ambassador for the American Diabetes Association, a cause that is very dear to her heart because her father is a diabetic. Her father's illness taught Menounos and her family about the importance of maintaining good general and dental health. This included a diet packed with fruits and vegetables, many of which they raised themselves. According to Menounos, they also ate little-to-no junk food. These habits still help keep the busy celebrity journalist fit and smiling with beautiful, healthy teeth. Speaking of her smile, Menounos openly discusses her oral health in her interview with Dear Doctor magazine. She has had no major dental enhancements — not even braces — but does occasionally brighten her smile with tooth whitening. She also feels that her teeth are healthy due to the sealants she had as a child. We could not agree more with Maria! Sealants for the tiny grooves in teeth known as “pits and fissures” are something that every parent or caregiver should consider for their children. The enamel of newly erupted teeth is more permeable, meaning that the acids produced by bacteria in the mouth can damage these teeth more easily, making them more susceptible and less resistant to decay. The good news is that dental sealants help protect teeth until the enamel has matured. Because of sealants — along with fluoride, good hygiene, and better nutrition (including less sugar consumption), tooth decay has been dramatically reduced.